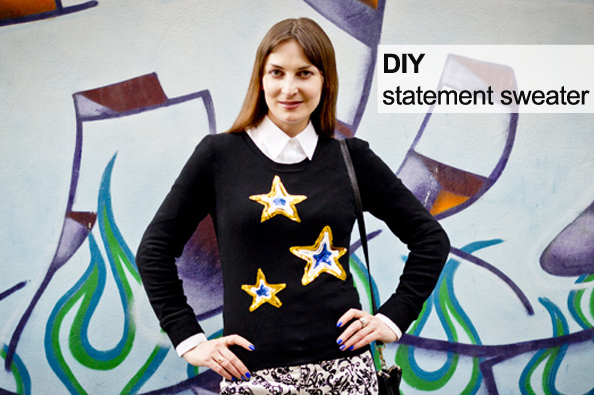 Whether you call this project a DIY sweater or refashion, one thing I’m sure about is it’s a great way to transform an old top into the ultimate IT piece – statement sweater! So I had a look through my wardrobe and found this black sweater that looked like a perfect piece to conduct my DIY experiment on. The experiment turned out very well, indeed. So today I’m sharing it with you, dear readers! 1. Place the patterns on the garment and secure with pins. You can buy patterns in Lincraft or create them yourself by drawing a star and then cutting it out (that’s what I did). 2. Trace around the outside of star pattern with glue. Remove pattern. 3. Attach gold sequin strip over the glue starting at any point of the star and work around. Join and cut. 4. Repeat one more row of the same color inside. 5. Repeat step 2 and 3 with two white rows. 6. Continue with blue sequins strips until the entire shape is filled in. Lay on flat surface to dry. 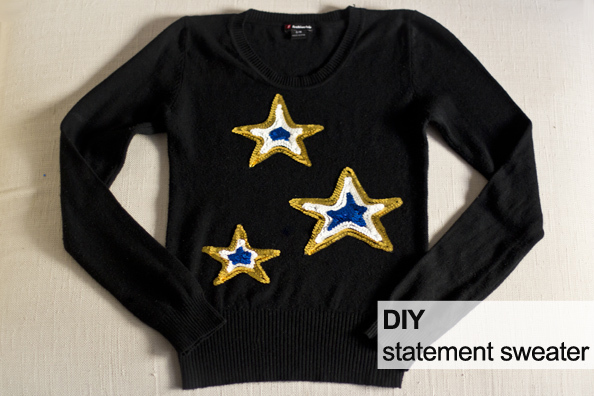 Optional: secure the sequin strips by stitching the points of the star to the sweater. Enjoy your new pretty statement sweater! I’m definitely enjoying mine – photos of the outfit will follow! PS. More DIY projects can be found here. CUTEST sweater ever!!! I absolutely adore it and think it’s a wonderful idea especially if you are bored with what you own! I WANT IT! 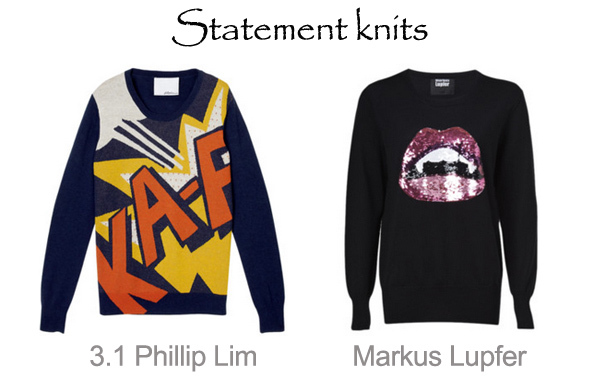 Your jumper is perfect, will definitely try to re-create it. Thanks for the idea!